Here at Boulevard Ford, your local Ford dealership, we extend a heartfelt thank you to those serving in our different military branches as well as our first responders for their sacrifices for our country. 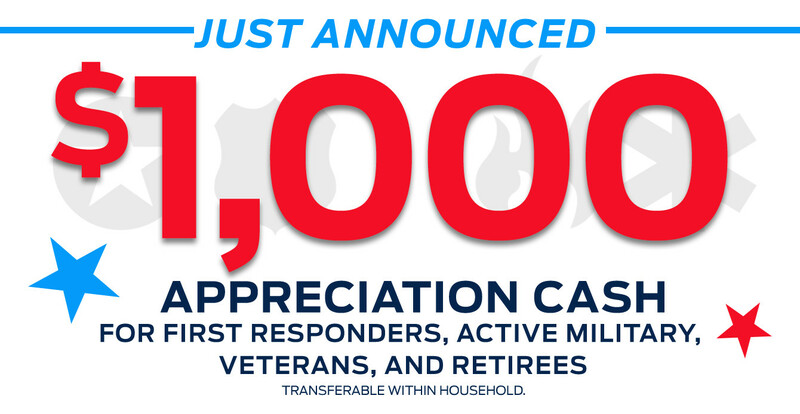 We want to do our part for you, which is why we are offering the exclusive Ford military and first responders discount. This program provides a $1,000 Military Bonus Cash Offer toward the purchase or lease of an eligible Ford model. Our staff here at Boulevard Ford, your local Ford dealership, is proud of this offer. Those who have served or are currently serving in the U.S. Air Force, Army, National Guard, Coast Guard, Marine Corps, Navy, or the Reserves and their spouses are welcome to apply for the Ford Military Bonus Cash Offer. First responders such as, EMTs, police officers, firefighters, and 911 operators also qualify for this offer. Our team at Boulevard Ford, your local Ford dealership, is proud to assist our community however we can. We believe helping veterans or active military members is one of the best ways to do so. Boulevard Ford is your home to purchase or lease a Ford with special military pricing. We are glad to honor everything that our military does for us and we consider it a privilege to provide the Ford Military Bonus Cash Offer. We have a large range of Ford models, like the Ford Expedition or the Ford F-250, that you can check out. Contact our team or visit Boulevard Ford, your local Ford dealership, today to participate in the Ford Military Appreciation Program and drive off with a Ford that will change your driving life.